Science, August 6, 2010, Vol. 329, No. 5992, pp. 679-682. August 26, 2010 Boston, Massachusetts - Since the winter of 2006–2007, more than a million bats have died in the United States and now in Canada from an insidious fungus called Geomyces destructans that leaves its white “dust” on the noses, faces, ears and wings of infected bats. 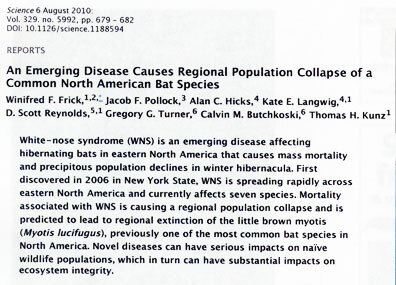 This bat-killing fungus was unknown before 2006. Next PostNext Where Did Our Moon Come From?